Are you suffering from chronic pain? Tennis Elbow, Golfers Elbow, Epicondylitis, Calcific tendonitis, Plantar Fasciitis, Achilles Tendonitis, Patellar tendonitis or Chronic glut/Hamstring pain? The ANSWER is Radial Shockwave Therapy. Tendonitis is the inflammation of a tendon due to micro tears that are caused by repetitive actions. To put it simply, your tendon is irritated from doing the same action over and over again. What is the best treatment for Tendonitis? Radial shockwave therapy is the most effective and efficient method of treatment for any tendonitis injury. Scientific research has shown it to be 80- 94% effective in the ridding of chronic tendonitis pain in as few as 3 treatments over the span of 15 days. The first thing we have to understand is that in order for a tissue or tendon to heal it needs blood flow to it. The reason for this is that blood brings in all the healing factors to a tissue so that the tissue is able to repair itself. Another thing to keep in mind is just like ligaments, tendons have very poor blood supply, therefore they heal slowly. Radial Shockwave Therapy applies loud audible waves and vibration to aggravate the tissue. This aggravation creates neovascularization(new blood vessels) to the tendon. How this helps? By creating new blood vessels to the tendon we create blood flow to it as well. The blood brings in the healing factors and the tissue healing process is accelerated dramatically. Listed below are some of the conditions that Radial Shockwave Therapy has been scientifically proven to be highly effective as a method of treatment. They different conditions are organized by the most common sport they are found in. However anybody may experience any of these injuries regardless if they are an athlete or not. 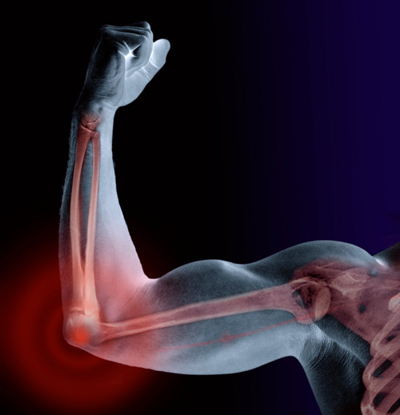 The pain in your elbow that you are experiencing is due to overuse of the flexor and extensor muscles in your forearm. The good news is that the scientific research is showing this to be the most effective and efficient method to rehabilitate this problem so that you can get back to your game as quick as possible. The pain you are experiencing is due to breakdown of the tissues from repetitive stress. The scientific evidence touts this as the gold standard in care for Plantar Fasciitis, Patellar tendonitis, and Achilles tendonitis. My clinical experience has shown it to be highly effective in the rehabilitation from Chronic Glut-Hamstring strains as well. The listed conditions are usually caused from trauma, arthritis, or repetitive strain in the joint. The literature and research has shown this highly effective in treating these conditions with long lasting results. For most of the above listed conditions it has been found patients will experience instant relief after as little as 1 treatment. However, all treatments require 3 treatments over the span of 15 days for full effectiveness and benefits.